January is here! The month of New Year resolutions and fitness commitments that we all make to begin the year on a healthy note. It’s that time of the year when you’ll see highest population count hitting the gyms and buying fitness equipments to initiate a healthy lifestyle for the rest of the year. So, if you’re one of them and bought yourself the latest Fitbit tracker over the holiday sale, here are a few tips to make the most of your new gadget that’ll let you accomplish your fitness goals faster. The first and foremost thing to do is to connect your fitness tracker with Fitbit app. But before you do that just make sure that you charge it completely so that it doesn’t run out of battery during the setup. Once you have installed the Fitbit app on your Smartphone, launch the app, choose your Fitbit tracker model from the list and follow the on screen instructions to complete setup. Make sure that you enter right details about your height, weight etc to improve its accuracy. Clock face acts like the home screen of your Fitbit tracker. You’ll see a variety of information here on the first glance including step count, heart rate, date and time etc. To select your clock face, go to the Dashboard of the Fitbit app and then tap the account button in the top-right corner. Now tap on your device’s name to access its settings page and then scroll through the various options for your model. You can easily arrange and re-order all the items that appear on your tracker’s clock face. To customize the display head back to the settings window and tap on “Customize Display”. Here you can add and remove any items as per your preference and set up the display just how you like it. To analyze how close you are in achieving your fitness goals, you can set up daily fitness goals on your tracker for better results. You can set various values on parameters like Distance, Calories Burned, Active Minutes or Floors Climbed. To do this, head on to settings, tap on “Main Goal” and select which goal you want to strive to hit each day. Now go back to previous window to come out of settings and head on to the main “Accounts” page. In the Goals section, tap Activity to change the default value for your main goal depending upon your activity level and stamina. Forgo to carry your Fitbit watch to gym this morning? Don’t worry! 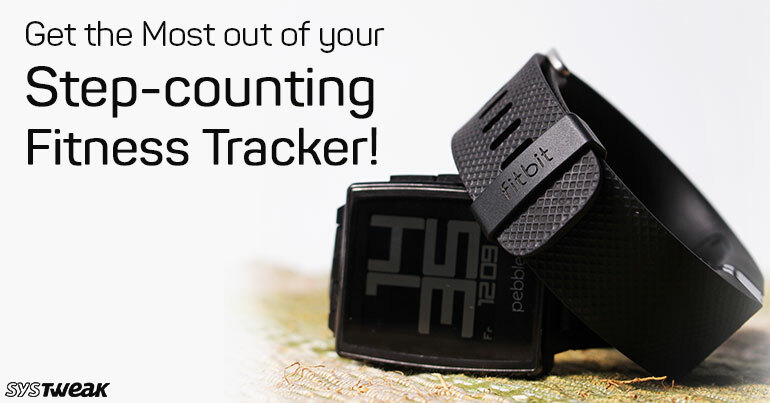 The new Fitbit tracker gives you enough leverage to manually log in your workouts (But you ought to be honest here!). Tap the Exercise tile on the app’s Dashboard and then tap the stopwatch in the top-right corner. Make sure the switch at the top is set to Log (and not Track). Now search for your exercise type like walk, swim, baseball and enter the accurate time of how many hours you engaged on this activity. Since Fitbit syncs pretty well with your heart rate, it’s good to analyze your sleeping patterns, right? To do so, head on to app’s dashboard and tap the Sleep tile. Tap the gear icon in the top-right corner to set your sleep goals. Your new Fitbit tracker allows you to control what you share with your friends and public. If any point of time when you wish to customize the privacy settings, tap the account button in the top-right corner and then select your name. Now, tap Personal Stats and then choose the privacy settings for each like whether you want it to be Private, Friends or Public. Achieving fitness goals gets even more better when there’s a competition. We know when it comes to workouts we get pretty lazy and often start skipping going for a walk or to hit a gym. To avoid this you can add your friends or family members to urge each other on for finishing your fitness goals faster. Tap the + button at the bottom and then tap Add Friend. You can easily find your friends from your phone book or Facebook account. Good enough? Hope this gave you plenty of reasons to kick back your laziness and start an active routine right from today!